Home > Magazine Articles > Are You Sure You Want to Be in Command? I remember years ago watching young firefighters in volunteer companies race to ride the front seat – after all, the radio, the sirens and the horns were the priority. In career departments, firefighters would want to “ride up” when the lieutenant or captain had the day off, sometimes for the same reasons. I did both as many of you did and do. The first interesting transformation happens (hopefully) when firefighters go from firefighter to company officer and you have to deal with, as Chase Sargent says, the “Buddy-to-Boss” stuff. It’s a big deal. Not something that’s easy in career or volunteer departments. The next real interesting transformation (again: hopefully) is when a company officer goes from the front seat of the rig to the front seat of the chief ’s car, chief SUV or whatever your command officers arrive in. Suddenly, you own that scene. It’s a huge deal. You are the bottom line of every aspect and action at that incident. You are command, control, accountability and communication. Your “day” has come and hopefully, those before you have provided solid and verifiable training that is actually applicable to the job you now own and the massive responsibility you now have. When things go right – and hopefully they do purposely – it’s a good day, and that is what happens most days. Again, hopefully by design versus just because. 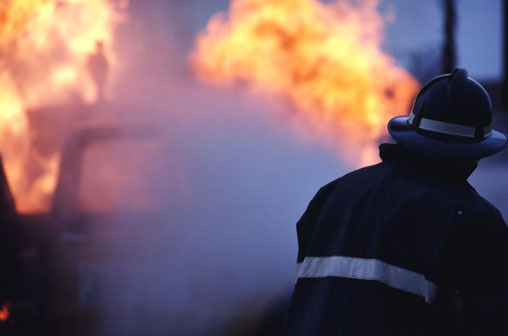 However, when things go wrong at the fire or on the fire training ground, it can be life-altering. Life-altering to you … which includes your family and friends around you. So many chiefs and firefighters that I work with essentially gauge their lives as “before” and “after” following a Line of Duty Death in their department. Take a few minutes to become very familiar with these incidents involving the predictable and preventable Line of Duty Deaths of two firefighters. These were not heroic deaths. The first is the Line of Duty Death of a Dallas, Texas, firefighter. If you have ever commanded (or dreamed of commanding) a fire, absolutely read this article and the reports (link at the end of this column). It clearly identifies decisions by the incident commander as being critical factors leading to the death of a firefighter. The second is the Line of Duty Death of a fire officer during “smoke diver” training. Surrounded by firefighters, officers and instructors, this firefighter could have been saved … but wasn’t. Check this out: Firefighter Neal Smith was almost out of the second floor of the six-story training tower when he became disoriented and fell to his knees. Smith had excelled through the first day’s exercises, and he was doing fine on day two. He was one of a few to clear a bunker with air left in his tank. Others quickly depleted their supply as instructors, perched above the rafters, threw firecrackers and lassoed the trainees’ air tanks with bungee cords. And now he was making his way through four floors of the tower until he reached the room where the mission was a right-hand victim search: Trainees had to slide beneath a plywood plank screwed to the entryway 30 inches above the floor and conduct a counter-clockwise sweep of the room while keeping their right hands on a wall. Visibility was impaired by a fog machine and by a web of fire hoses and landscaping timbers hanging above a floor littered with golf balls and marbles. Weighed down by 75 pounds worth of gear that included an air tank, mask, coat and trousers, still saturated with sweat from the previous day’s exercises, trainees had to navigate their way through pallets, tires, metal pipes and burned-out box springs to reach a 2-by-10-foot wooden box with one end propped upon a barrel. The men had to crawl through the box, which spilled out into a floored elevator shaft, and then crawl back through to continue the sweep. While sliding under the plywood barrier, the teammate reached behind him one last time to feel for Smith. Feeling only fiberglass, he turned and saw the reflective tape on Smith’s helmet. There was no movement. The teammate made it out to the second floor landing when the call went out: Mayday. Man down. Instructors slid an unresponsive Smith under the doorway’s plywood barrier, down the darkened stairway and out of the tower. On-site paramedics stripped off Smith’s gear and clothing and felt for a pulse that wasn’t there. They administered CPR then tried a defibrillator, but Smith’s skin, slick with sweat and hot to the touch, prevented a connection. Ten minutes later, an ambulance rushed Smith to the emergency room. Doctors swathed Smith’s overheated body in ice packs and cooling blankets. They cranked up cooling fans and shot him up with cold liquids. None of it would save his life. According to the subsequent investigations, what may have saved him – or at least increased his odds – was one very simple thing: a tub of ice water at the scene. Take some time to read the articles and the related reports. If these reports do anything, they remind us that like every firefighter, training as a command officer never stops. Everyday is a training day … from reading, reviewing, studying, simulators, hands on, live drills or whatever, the “coaching staff” of the fire department’s responsibility to take care of their “players” is never ending. It’s a massive responsibility and it is not for everyone. These reports also remind us of our total no BS responsibility to take care of our people in what can certainly be tough conditions … but that is our 24/7/365 commitment and responsibility. While our people operate in tough conditions and just like we expect them to perform as expected operating “interior,” they must be able to expect and count on us on the outside, in command roles, to do what we must do to take care of them. And lastly, these reports remind us that in 2014, people are asking questions, families want to know, investigations are conducted, and attorneys are lined up to help them determine the truth on how and why their loved ones died. Command is nothing new in the fire service. However, the defined responsibility, the tasks, complexity and expectations have evolved over the years into what we know as today as an extremely intense role requiring training and skills like never before. Need proof? Seriously?! You can read for yourself here.